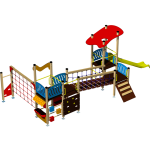 Wide range of classic equipment from Maderplay where the parts of the playground become elements of fun and adventure. Combiplay is our longest serving product range with almost 20 years on the market and in children’s hearts. Compact and light structures with a myriad of play sets and themes. It strikes the perfect balance between simplicity and harmony of shapes which become participative areas where the fun is guaranteed. Aimed at the smallest children from 0 to 3 years old, characterised by attractive motifs in vivid colours, recreating fantastic worlds. Structures are made from polythene HDPE for both indoor and outdoor use, easily transported and free from metal fittings. Outdoor equipment designed for the most daring kids, adventure guaranteed, manufactured with braided nylon rope reinforced with galvanised steel thread. Playground furniture that opens up new possibilities and dimensions of fun and games. This term is given to those elements which can be used by children who have disabilities, but by the same token are not exclusively aimed at them. The idea is that all children, both disabled and not, play together. A fresh concept in teenage recreation. Meeting points are casual robust structures, manufactured with plywood and large metal sections. They aesthetically complement urban settings and keep the teenagers from interfering in the little ones’ play time. Our Colurs line looks, as it’s name suggests, to fill the city and our lives with vivid colours so the children can play in this atmosphere. For climbing, jumping and demonstrating skills, rock walls, Petanque courts, chess boards, etc. are ideal choices for recreation in urban areas.